Event rider Piggy French is here to explain why a secure and balanced position in the saddle is so important and how it can help to boost your confidence. Riding in a good, balanced position is good for you and allows your horse to move correctly and freely. It'll also work wonders for your confidence too - when you feel secure, you can ride with more assurance. Just getting into the routine of assessing your position each time you ride, or asking a friend to video you are both great ways to ensure you're riding as well as you possibly can. How you sit in the saddle has a huge influence on your horse. The more balance you are in the saddle, the better your horse will move. Your lower leg position is essential for secure riding. Try this exercise to improve your leg position. A good jumping position is essential. It gives your horse the freedom to bascule over the jump and tuck his front and hindlegs up, reducing the chance of him knocking a pole. It also keeps you over your horse's centre of gravity helping you stay secure and less likely to fall off. This starts as you're turning to approach the jump. 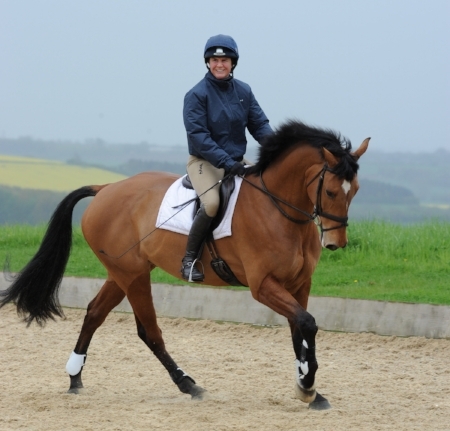 As you turn the corner towards the fence, stay in your canter position and keep your shoulders level. Stay relaxed in your knees to absorb your horse's movement. Keep your shoulders up - if you tip forward you'll put weight onto your horse's shoulders, which will make it difficult to jump clearly. On take-off, keep a bit of distance between you and your horse's neck. Allow your horse's wither to come to meet your chest rather than dropping your upper body too far forward. From your hips, allow your upper body to go forward while still maintaining your core. Your arms follow your horse's head and neck movement as he jumps. As you land, maintain your balance and don't collapse forward. Think about keeping your head up and your leg on to support your horse.